These personalised babies track pants are coming soon and are not available for sale at the moment. We are located in Sydney, NSW. 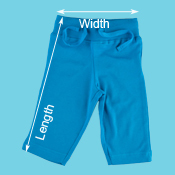 This personalised baby track pants with your own slogan will be posted through Australia Post within 5 working days.